ICopic Color Challenge #8 -Real Red, Yellow Green, and Egg Yolk. 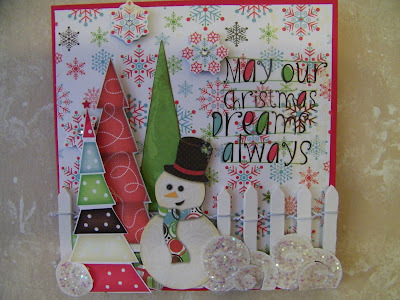 Here is my take on using an ornament and the 3 color for the Challenge. 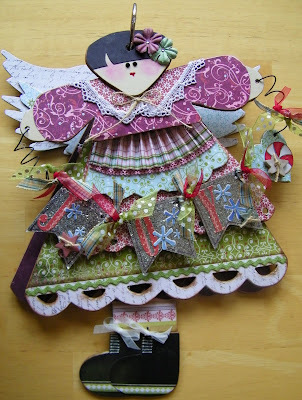 I made this angel for a friend that seen it on Two Peas in a Bucket. She brought me a photograph, a Maya Road Tree book and asked if I couldmake her one, this is my interpretation of the photograph she brought me. I used the Eskimo Kisses from Basic Grey to do the entire book. 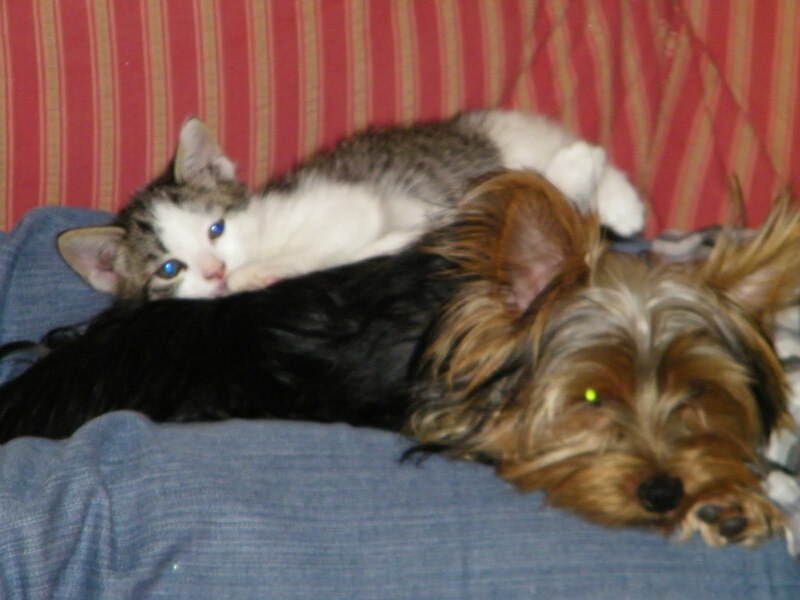 NOW...Let me introduce you to Charlie ( he is my sweet little Yorkie) and Gracie is our kitty. Charlie is 10 months old and Gracie is 4 months old. When we leave our home we always put Charlie in his kennel, but this one evening we were going with friends for dinner and then coming back to our house for a bonfire. We were gone for 2 hours and in that time one of them or maybe both got up on the table with our TV and got my book that I had so diligently been working on and had about 1/2 done and decided to have it for a snack. When we arrived home I started to show my friend all of the details of the book and that is when we discovered their adventure. All I could say was "CHARLIE" and he took off for his kennel. Hmm... makes me wonder if he wasn't the guilty one. NOW BACK TO THE BOOK...I looked high and low for another book and was unable to find one, so I did the next best thing. I got me some chipboard and a good xacto knife and took what was left of the book and drew another. 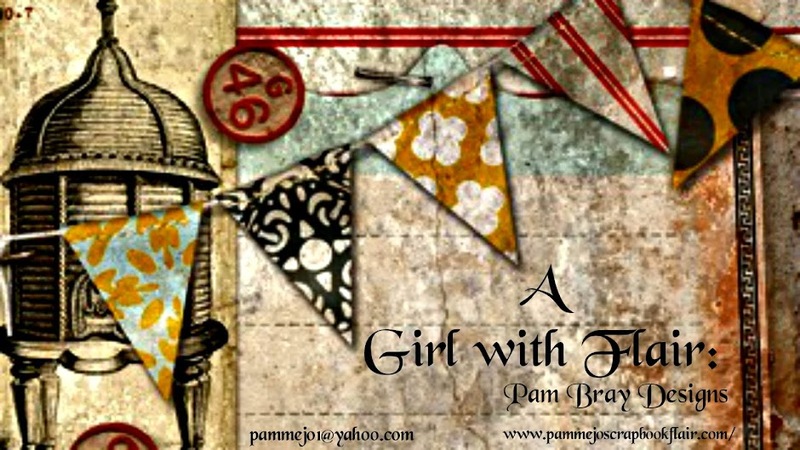 I think I did a pretty good job getting all of those scallops to look like the original book if I must say so myself.
. 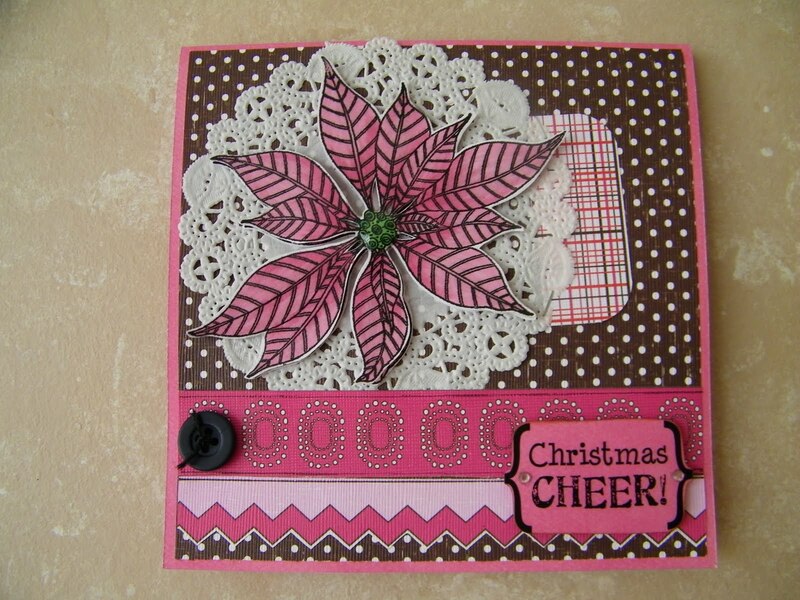 It is a Valentine collection but I thought it worked perfectly for my pink poinsettia card. 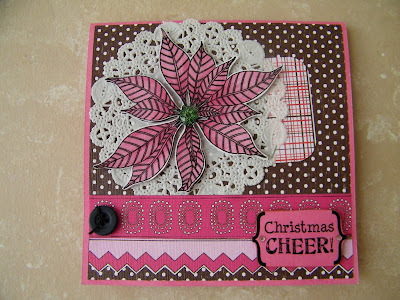 On this card I used a paper doily to place my Copic colored poinsettias on. I stamped the poinsettia twice on Coconut Swirl card stock and after I got it colored in I fussy cut them out. 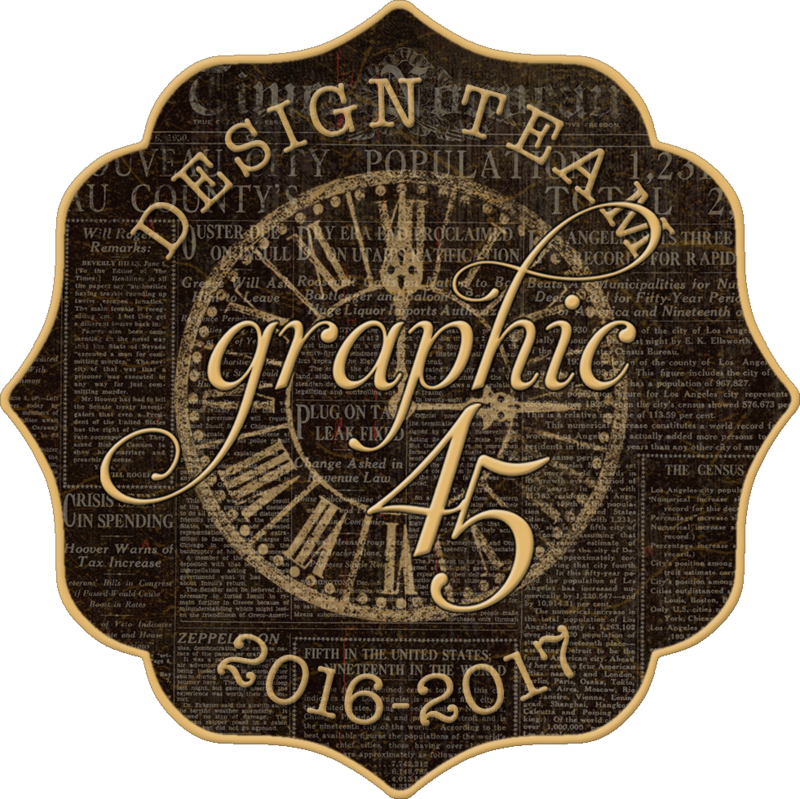 I colored the stamped image with R83,R85,G14, and G17. 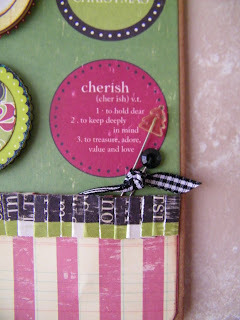 I used Bo Bunny Blush Dot as my 5 1/2" x 5 1/2" card. 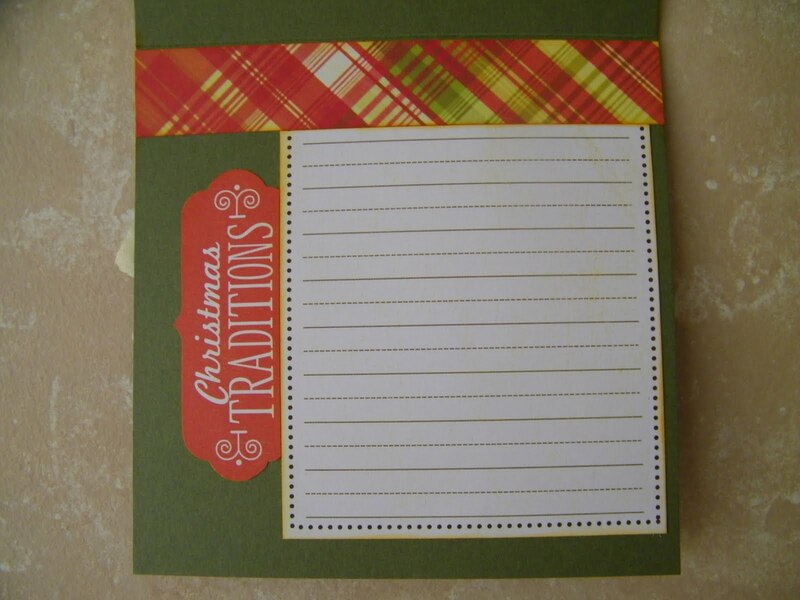 The Way to Go paper has 4 different squares on the paper so it is so easy to make a card with. 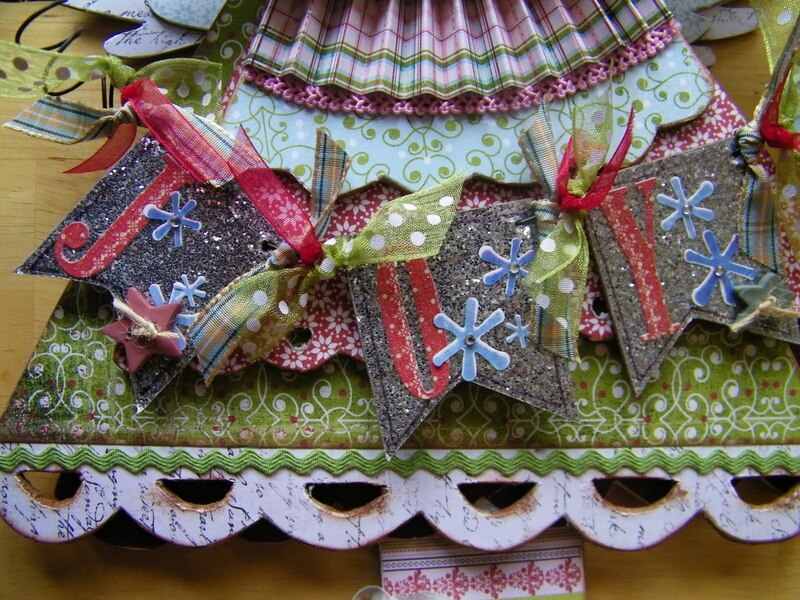 I used the brown polka a dot as the base to place on the background.I put the doily and poinsettias on next. 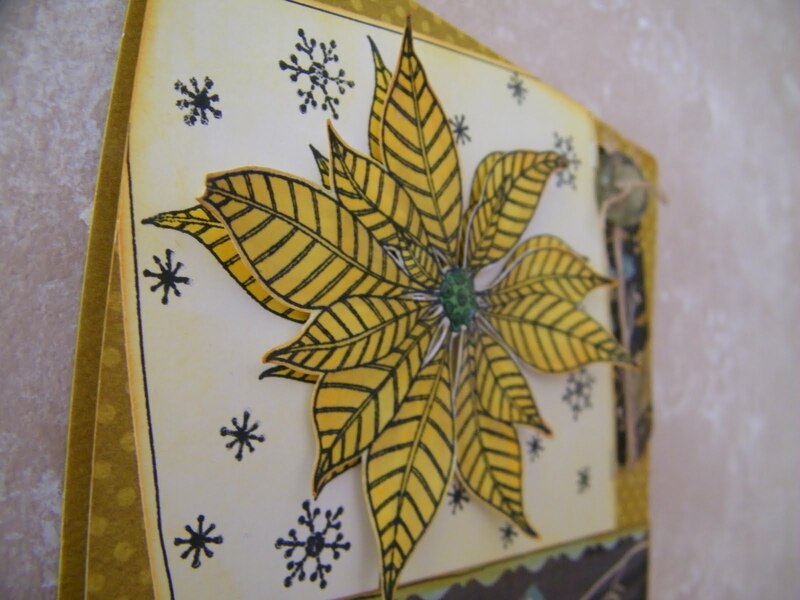 When I had them placed I used the Fine Glitter Glimmer Glaze and Glossy Accent on the poinsettia as I had in the previous cards. 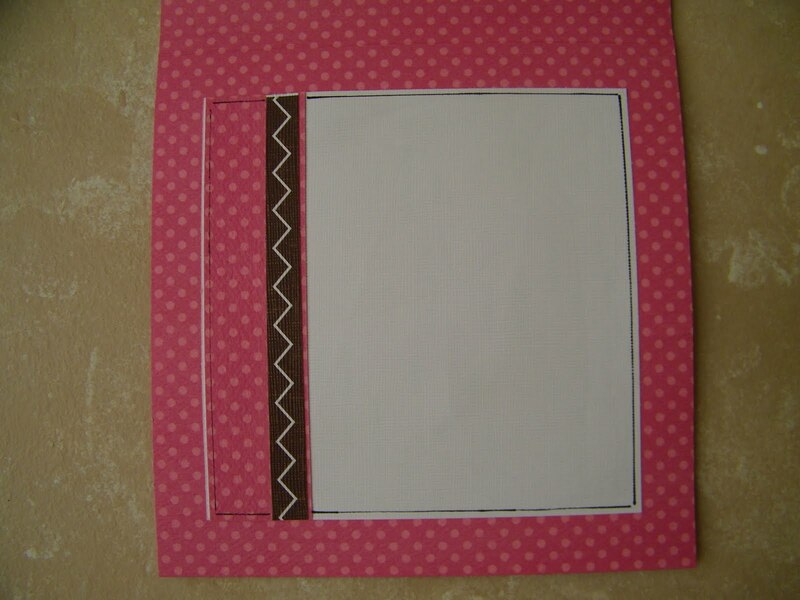 I added the stripes from the same paper. The "Christmas Cheer" is a SRM Sticker sentiment from the Happy Holidays Sentiment Sticker. I placed it on some of the Bo Bunny Blush Dot and then once I had it cut I placed it on pop dots. I added a button to the left of the strips that I had tied with black string using a glue dot. I used some of the Coconut Swirl and some of the Way to Go paper in the inside. I made this very cute Thanksgiving card using my Thanksgiving Cricut Cartridge and Recollection papers. 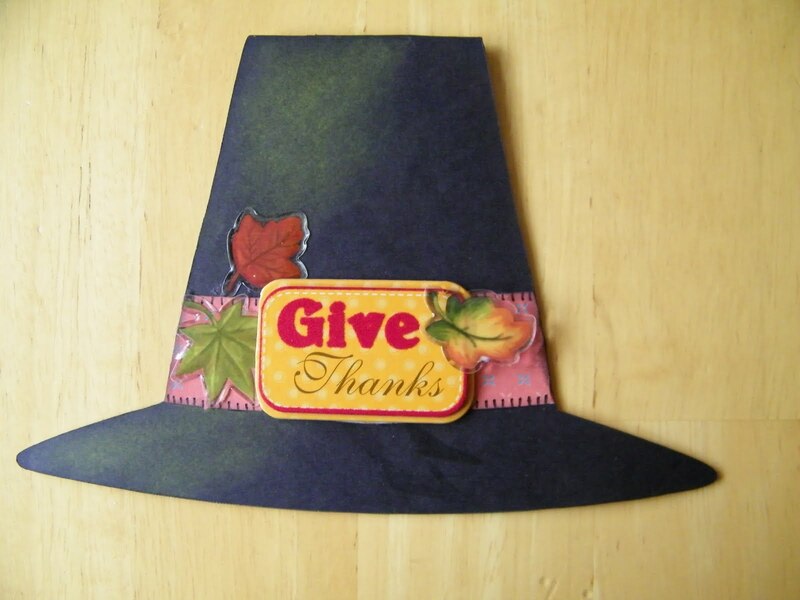 Super easy card, just use the pilgrim hat on the cartridge and cut the hat to measure 5". 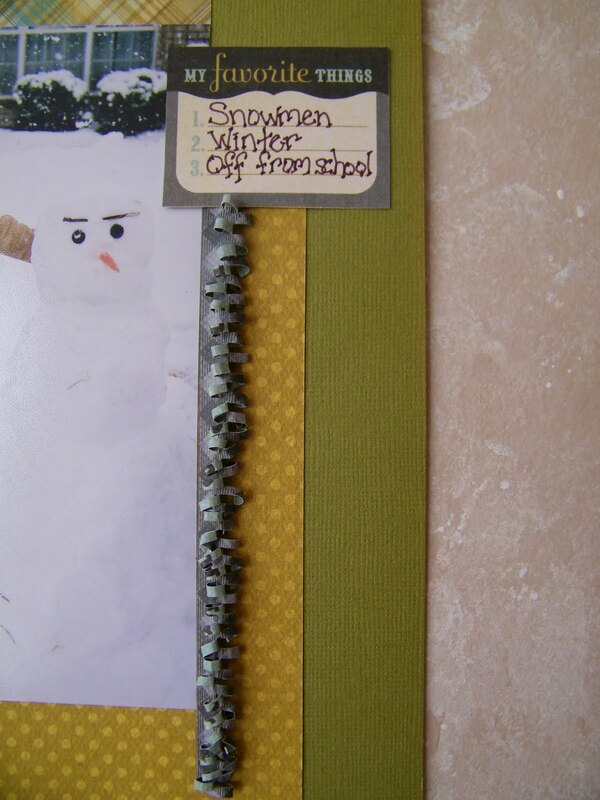 I used the Recollection paper to do the brim, I made stitch marks with my Black Zig Pen and some yellow chalk to high light the left side of the card. I used one of the Recollection dimension sticker for the buckle and placed it to the front of the band along with some of the Recollection sticker leaves. 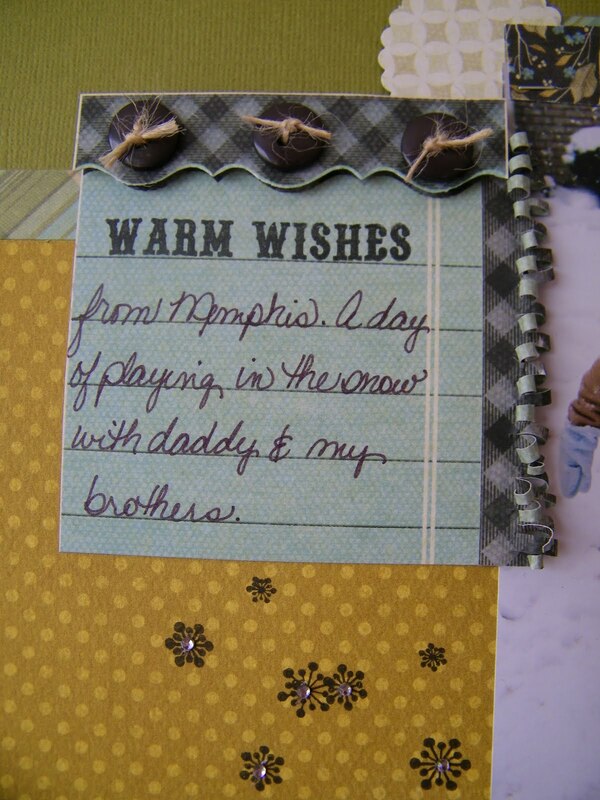 Inside of my card is a sentiment sticker from SRM Thank You Sentiments. Like I said super easy and way to just say thank you to all over this Thanksgiving Season. May you each have a blessed day. 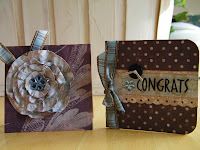 I stamped my image twice, one on a piece of 4 1/4" x 4 1/4" Coconut Swirl and the other on a scrap of the same card stock. I colored my images in using Copic Markers R24,R27,G14andG17. 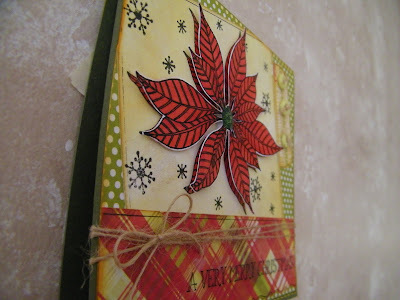 I adhered my stamped and colored poinsettia to a piece of We R Memory Keepers Wrapping Paper and attached a tab of the Wrapping Paper to the right of the stamped poinsettia piece. 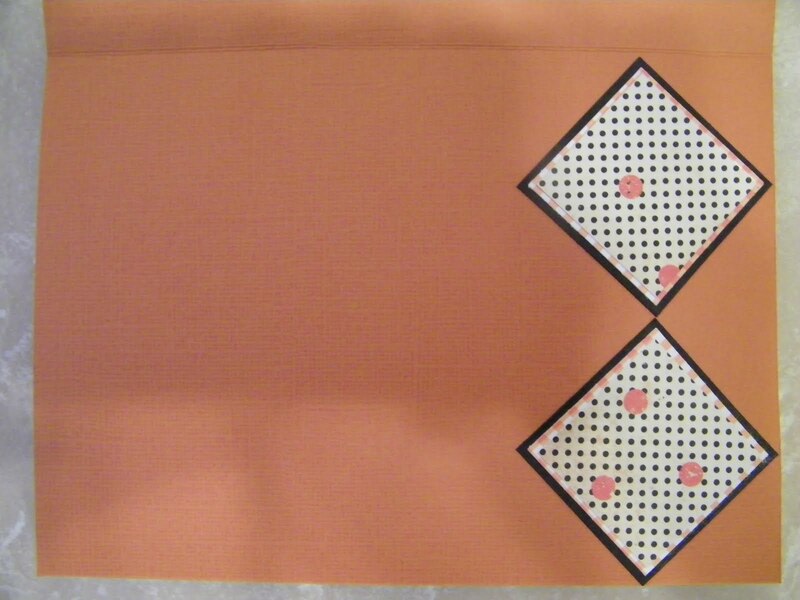 *The Wrapping Paper is a piece of 4 different squares on the same piece of 12x12 paper. 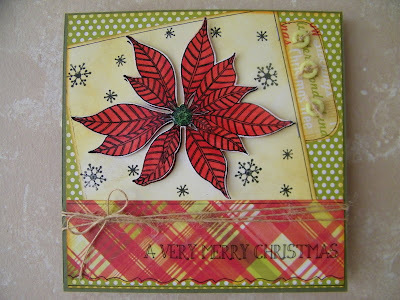 Here is a side view of the card so you are able to see the dimension that the poinsettia gets from using a pop dot. 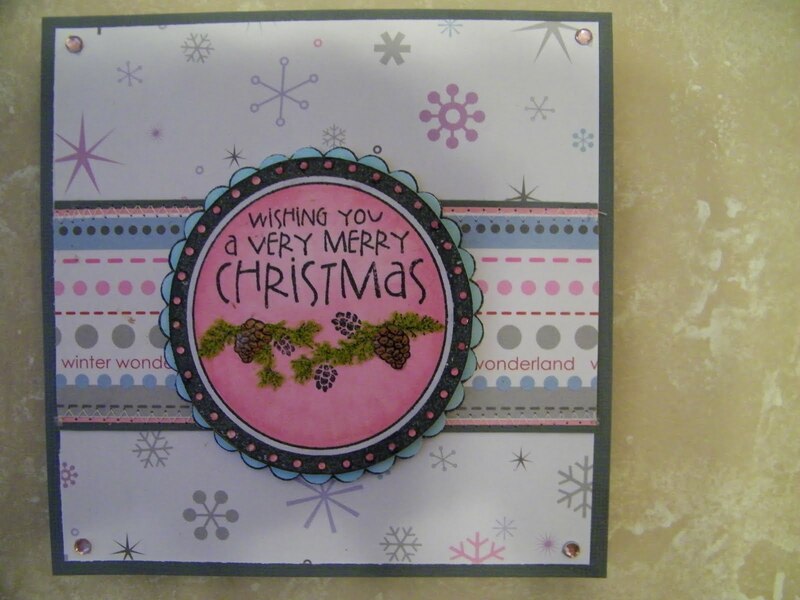 After I got it on my card I used the Fine Glitter Glimmer Glaze to make it shiny and added some of the Glossy Accent to give the center added dimension. 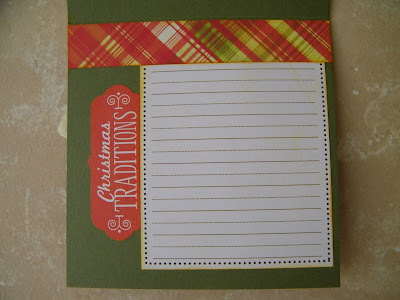 The plaid stripe again is from one of the squares on We R Memory Keepers Wrapping Paper. 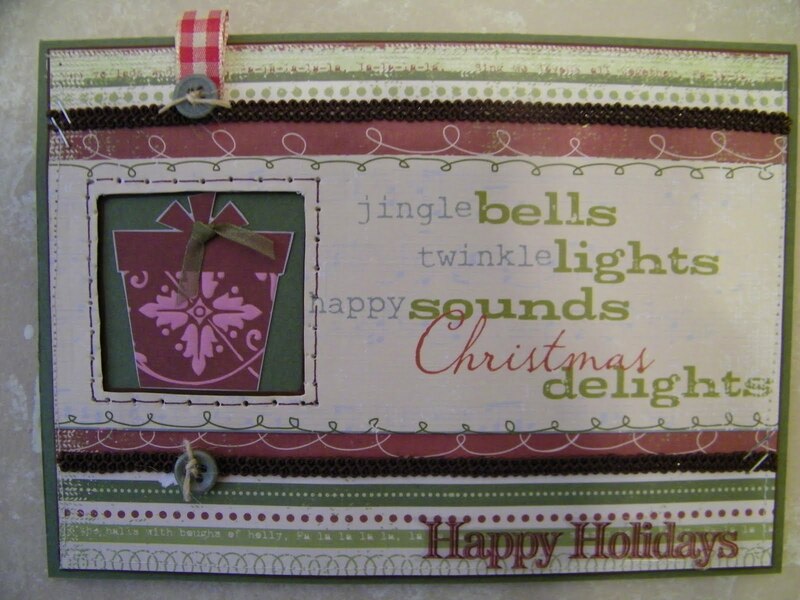 I used one of the sentiment from the Happy Holiday SRM Sentiment Sticker Sheet. I also wrapped some tan twine around the bottom strip after I had taken my Zip pen and added some line work to the strip. 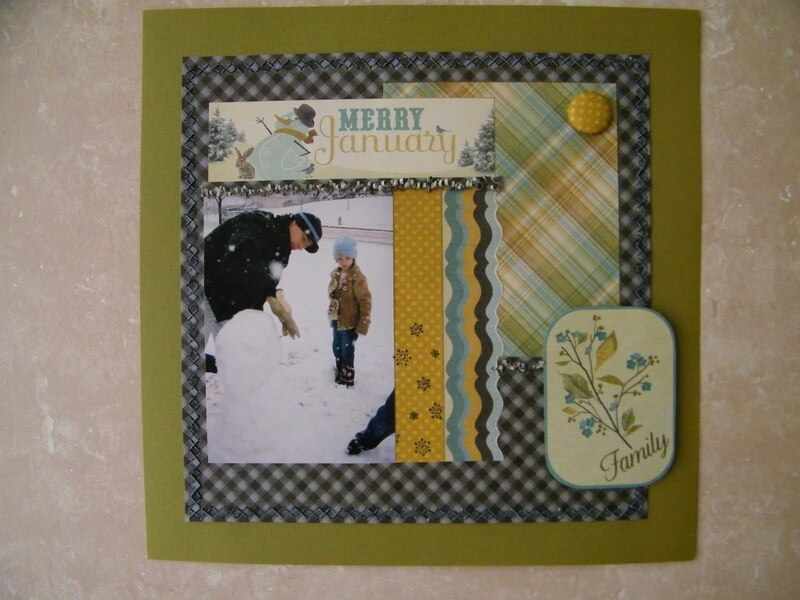 I used a piece of the 4x6 Albums Made Easy Pad from the We R Memory Keepers White Christmas Collection for the inside of the card. 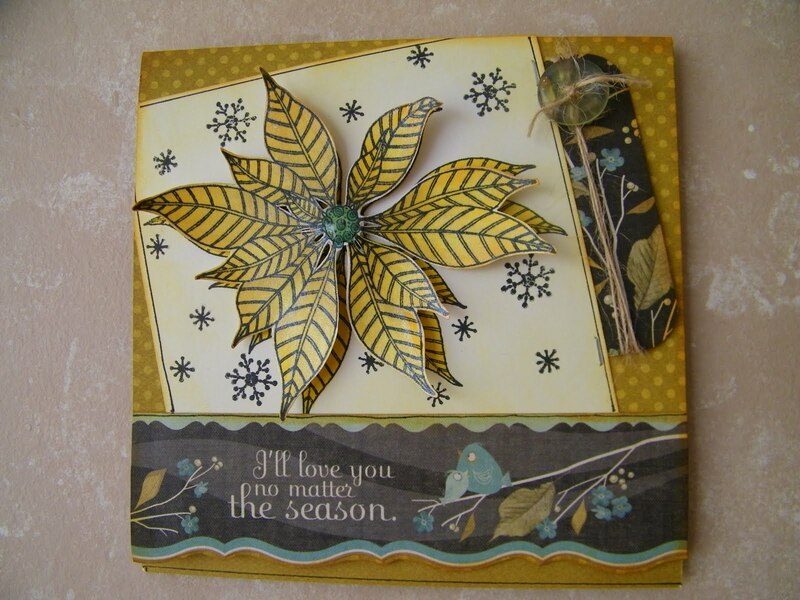 I used the Penny Black Poinsettia Stamp to make my card. My card is a 5 1/2" x 5 1/2" square card using Bo Bunny Curry Dot as the base part of my card. 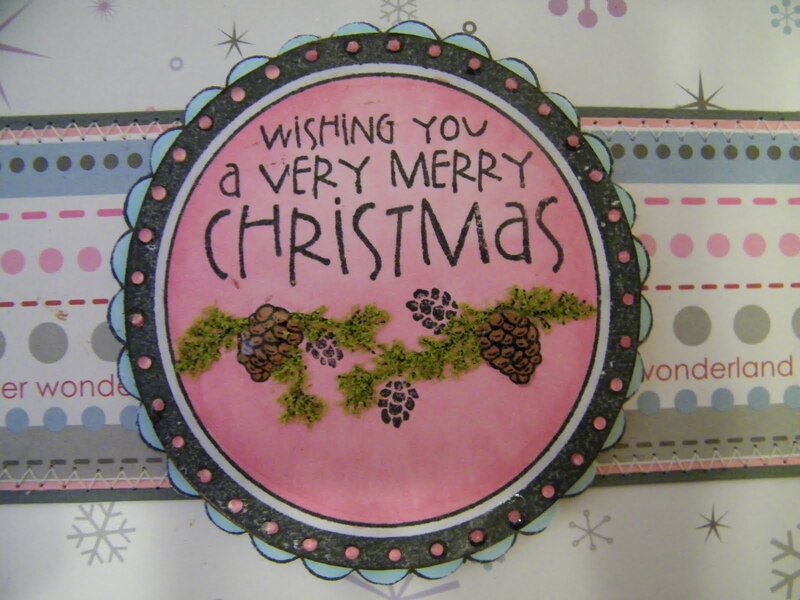 I stamped the poinsettia image on a piece of Coconut Swirl Bazzil and colored it in with Copic Markers G14,G17,Y26 and Y15, when I finished I fussy cut it out and set it to one side because I then did another image on a piece of 4 1/4" x 4 1/4" Coconut Swirl and colored again. I stamped some of the We R Memory Keepers Snowflakes around the poinsettia. When I was finished I adhered the Coconut Swirl to the top of the Curry Dot. I then added a tab to the right of the Coconut Swirl and a stripe from the We R Memory Keepers Mitten. I put the fussy cut Poinsettia to the top of the Coconut Swirl pointetta using a pop dot. 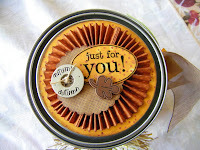 Taking some tan twine and wrapping it around the tab and adding a button I think gave my card some great dimension. 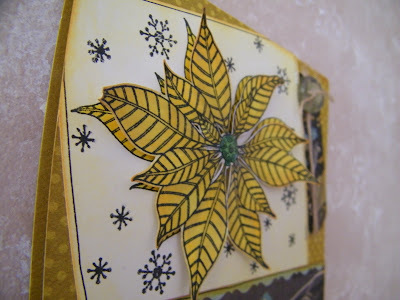 I also used Fine Glitter Glimmer Glaze on my poinsettia to give it the glossy look that I like so well. 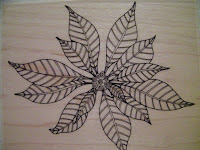 I added some Glossy Accent to the center of my poinsettia. 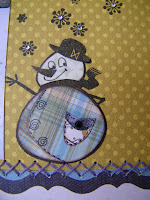 Finishing my card with a zig marker I did some stitch lines. 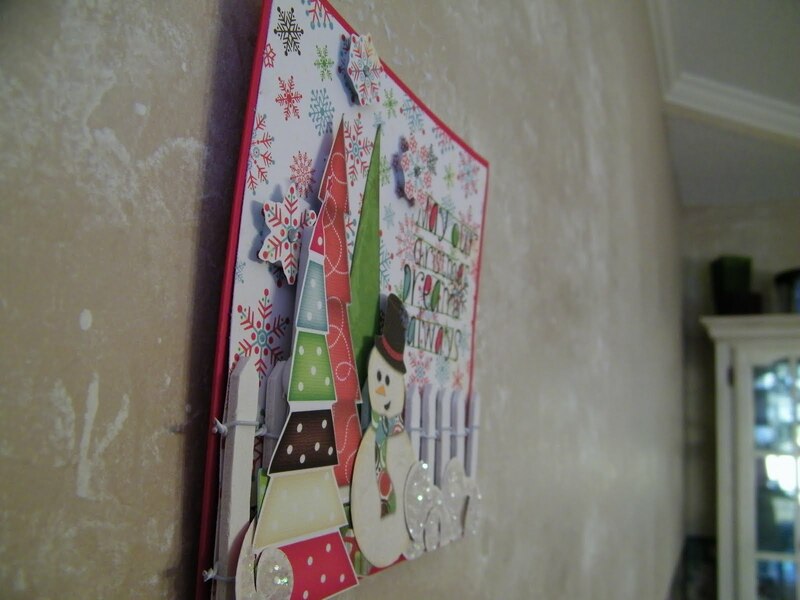 I love side views of projects so thought I would include one from my card so you are able to see the dimension. 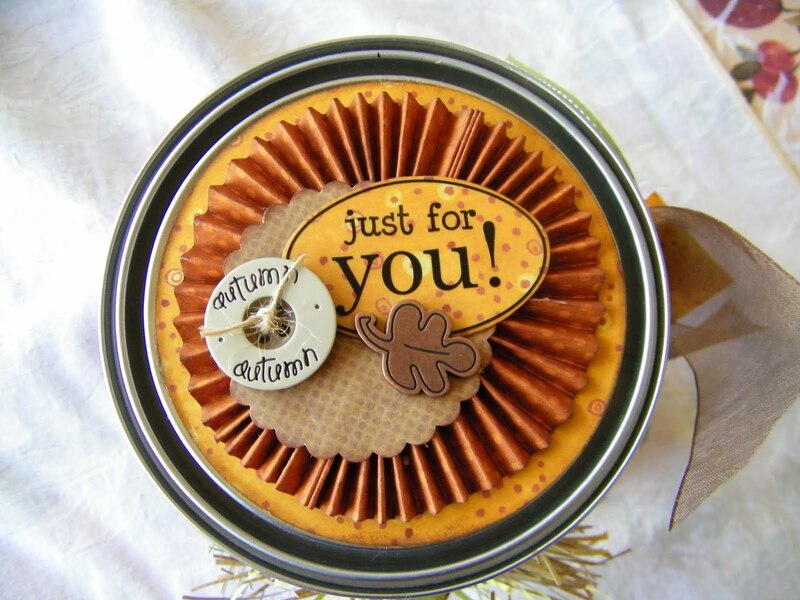 I just placed my Heartfelt Thanks can on Made by You Monday. 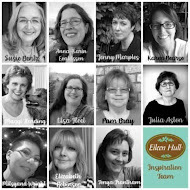 It is a blog that allows us to inspire each other and I must say there is a lot of inspiration. I decided since I don't tole paint much as I use to that I would just get some of them there old books out and see what I could do with them. I found this turkey in one, so I downsized it to 40% and started paper piecing it using the Imaginisce "Dino Roar" collection and the "Heartfelt Thanks" sticker from the Thanks SRM Sentiments. The grass behind the turkey is some of the Dino Primordial Ooze paper that I cut into small thin strips and placed them behind the turkey, once I had enough I attached the turkey to the can with pop dots. 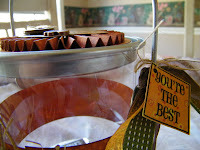 I also used some Bo Bunny Burnt Orange Dot paper and made a band to go around the center of the can. 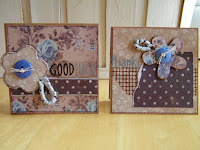 The rosette is from a piece of Stomping Ground paper. I cut two 1" x 12" pieces together and scored it every 1/4" until I go it completely scored. 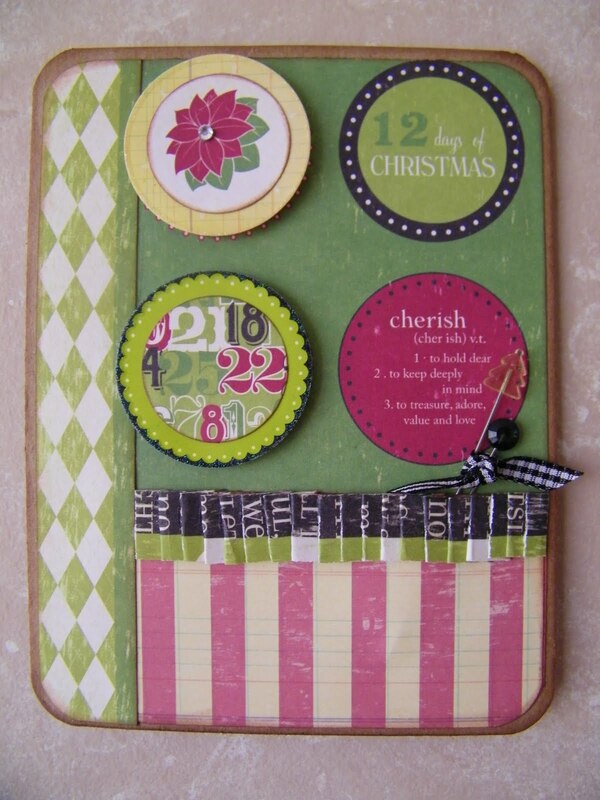 I then accordion fold and adhere it to the top Stomping Ground paper circle that I had punched out using a 3 1/2" Marvy Circle punch and attached it to the lid of the Stampendous paint can. 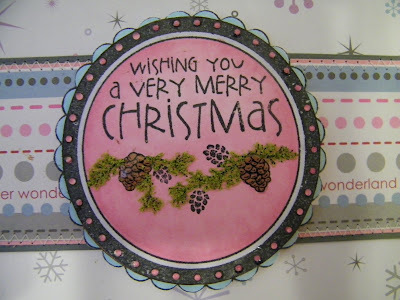 I used one of the SRM Sticker from the Thinking of You Sentiment sheet, placed it on a piece of the Stomping Ground paper, fussy cut around it and attached on top of a 2" scalloped circle. I added another SRM Sticker along with some pretty ribbons to the handle of my can. 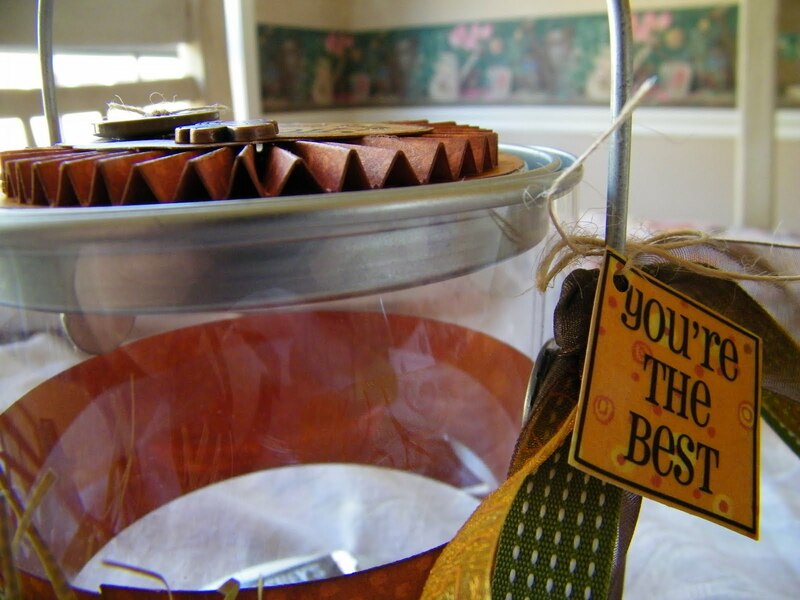 I will be putting candy in and sending off to a couple of sweet little turkeys that I know. 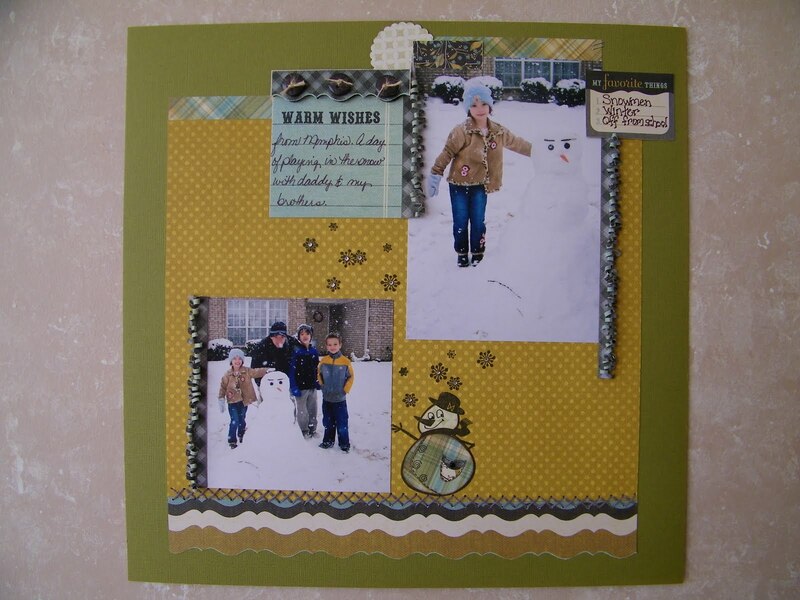 Hugs and Kisses and Misletoe Wishes-I made this card using Making Memories Mistletoe Collection. 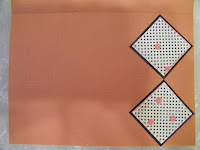 I punched out 4 circles from the Icon Dot paper and placed two of them on pop dots. I also added a clear gemstone to the center of one of the circles. 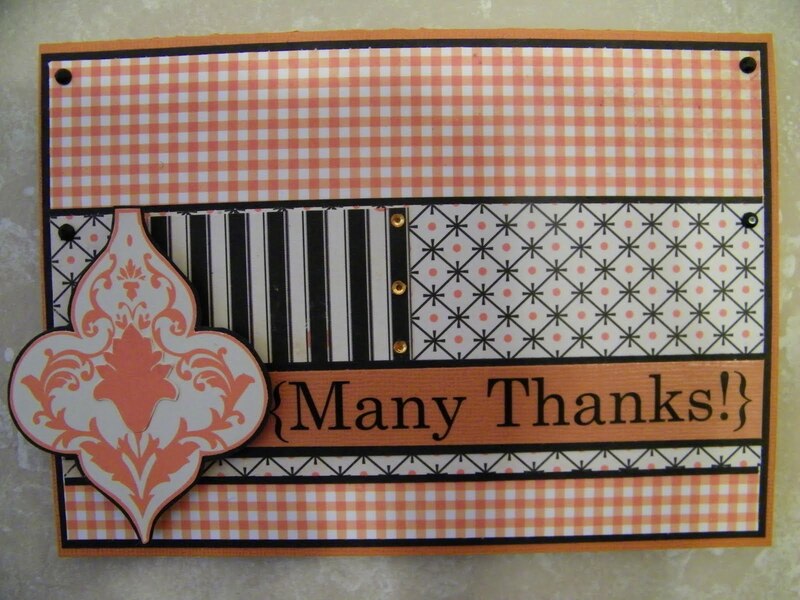 I pleated the Pattern Stripe paper and placed it over the Pattern Stripe. 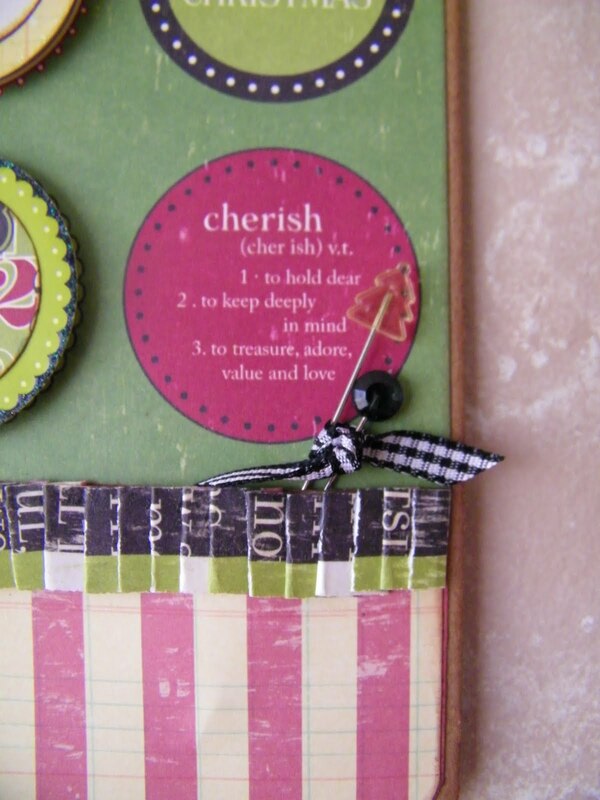 I also added these cute Making Memories Decor Pins along with a pretty gingham bow tied around them and inserted them into the pleated paper. 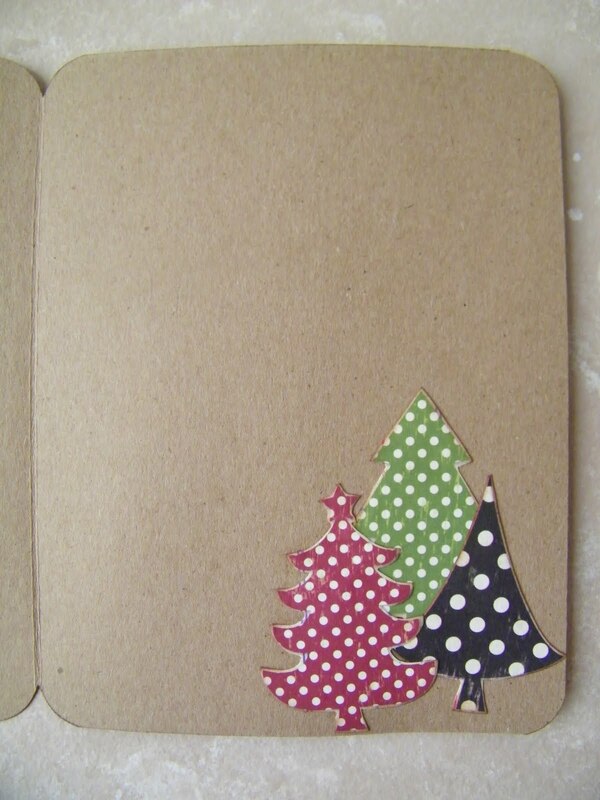 On the inside of the card I fussy cut some of the trees from one sheet of the paper and added them to the inside of the card. Can you believe Christmas is just a little over a month away. 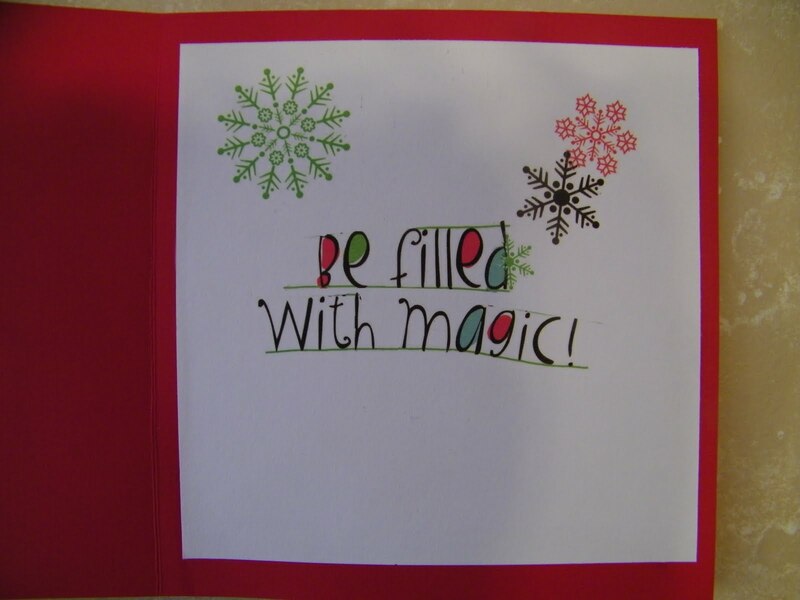 I made this card to send out to one of my friends to "Wish Them a Very Merry Christmas". 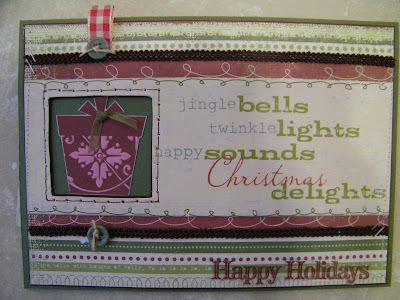 The stamps I used are Hero Arts Large Christmas and Classic Christmas Border. 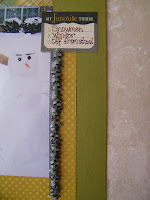 I love the KI Memories Winter Weather and Chill Out Ribbon Stripe Paper. I thought it made a wonderful non-traditional Christmas card. 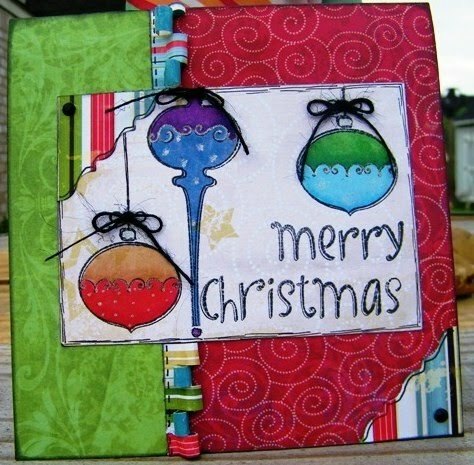 I stamped the Large Christmas stamp twice and colored just the border scallop on one and all on the other using my Copic markers. I also used Ultra Fine Flower Soft Sage and Glossy Accent to give dimension to the inside of my circle. I fussy cut one of the circles and placed on pop dots on top of the second scallop to give it that layer look. I adhered it to the top of my 5 1/2" x 5 1/2" card. Add a pink gemstone to each corner and I am ready to mail it out. 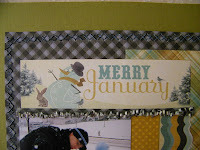 Merry January is a most benefiting title for my layout since it was in January that we had this snowfall. 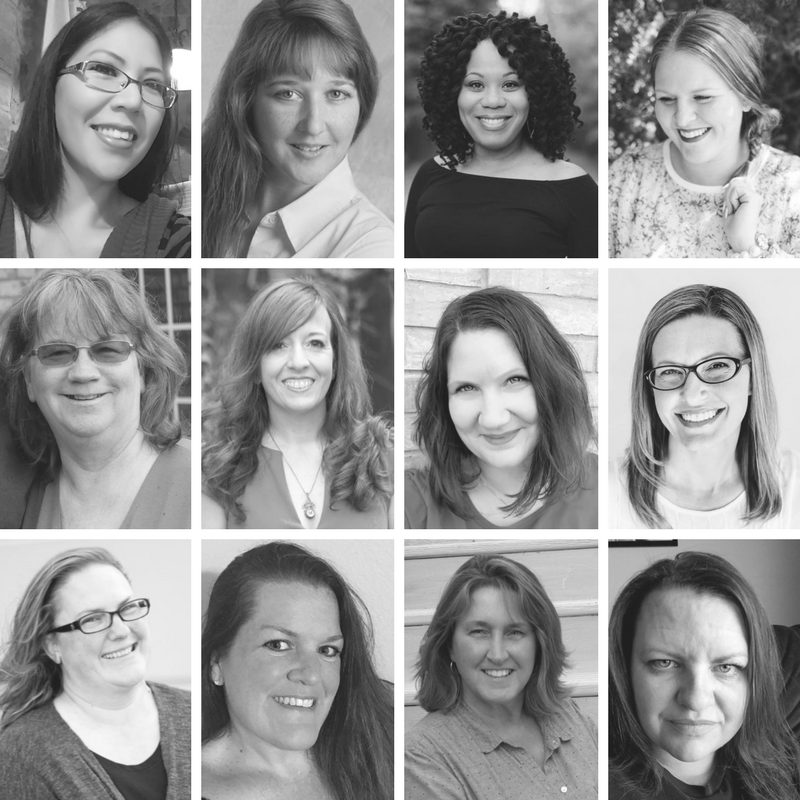 I decided I would go ahead and do the companion layout to go with the one that I posted last week, since I was on a roll with the Easy Sew from We R Memory Keepers. 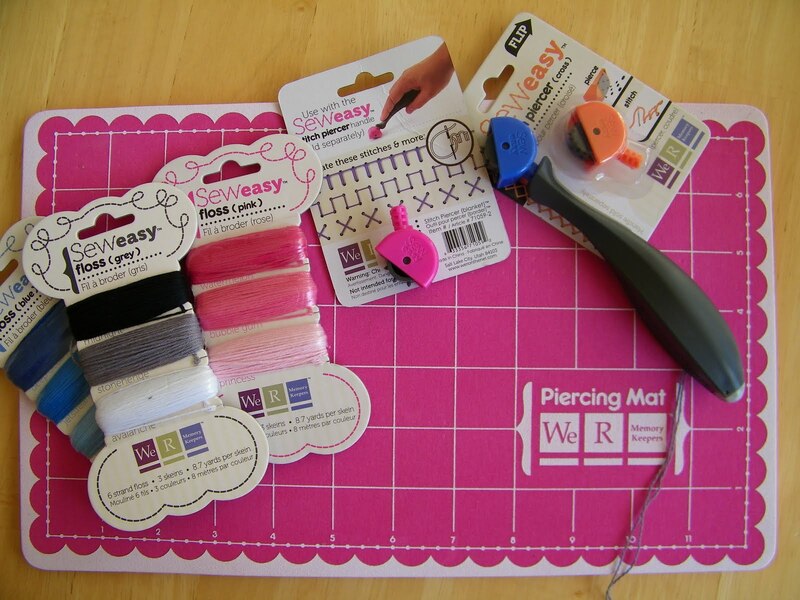 I just love this tool and "sew easy" to use. I went and purchased the other 3 tips yesterday. Can't wait to use them. A couple look like I will have to practice to get them mastered. 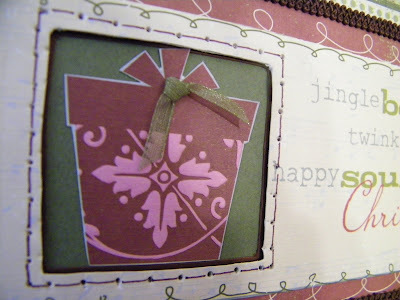 It is just a nice way to add stitching to your layouts. This time I took a strand of the grey with a strand of the blue to give my cross stitches some more depth. I am now thinking about going back to my previously posted layout and changing it to the same colors. Here are a couple of views so you are able to see the detail of the stitching and the ruffling of my border trim. I cut a 3/4' strip and then with my scissors cut narrow cuts into each line. I used tweezers to get the rolled effect. 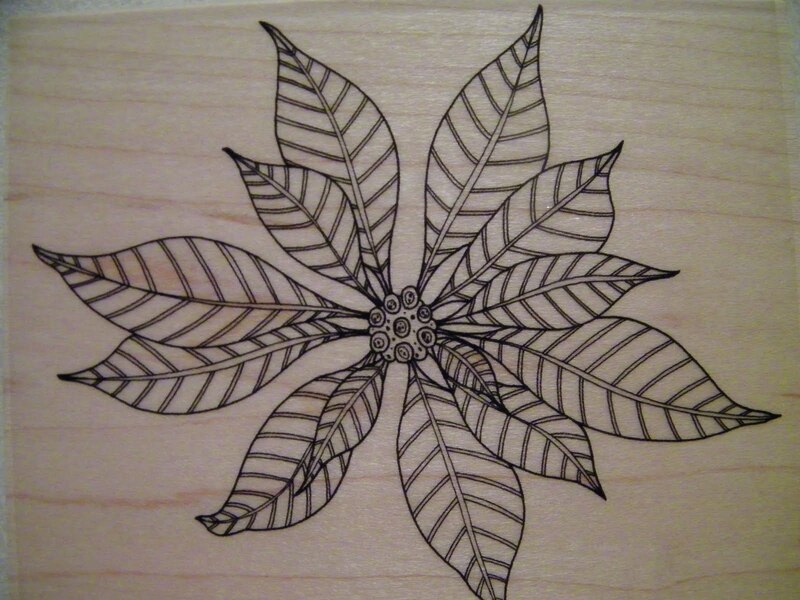 It is very tedious but yet I think it gave a fabulous detail to the page. Here are the two pages together. 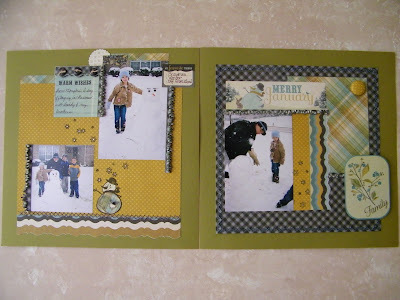 I know the green does look a little overwhelming on the blog but in reality it matches the greens in the We R Memory Keepers Merry January collections. I am entering this card on the More Than Favors blog for their Wacky Wednesday Challenge #16 Fall and Thanksgiving Theme. Love the reflection of the Thanksgiving season. We so often forget just to say thank you. 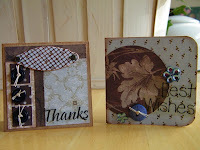 "Thank You" to all that have come to visit my blog, thank you to all that have encouraged my creativity. 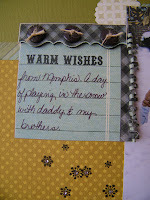 In 2011 I will be published in the Spring 2011 issue of Scrapbooking and Beyond Magazine. 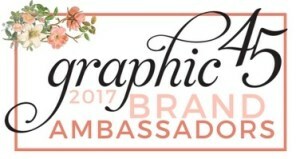 I can't thank them enough for the opportunity. 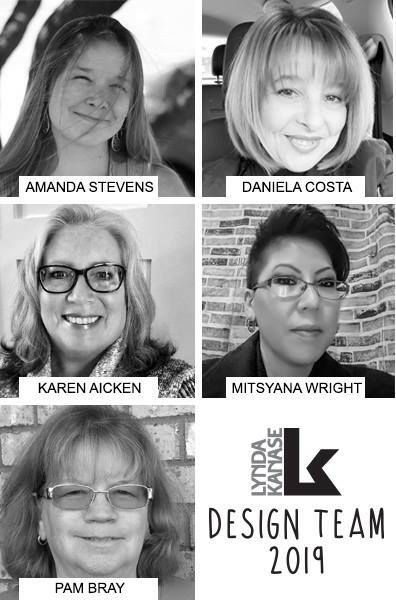 I will tell you the story once the issue is in print. 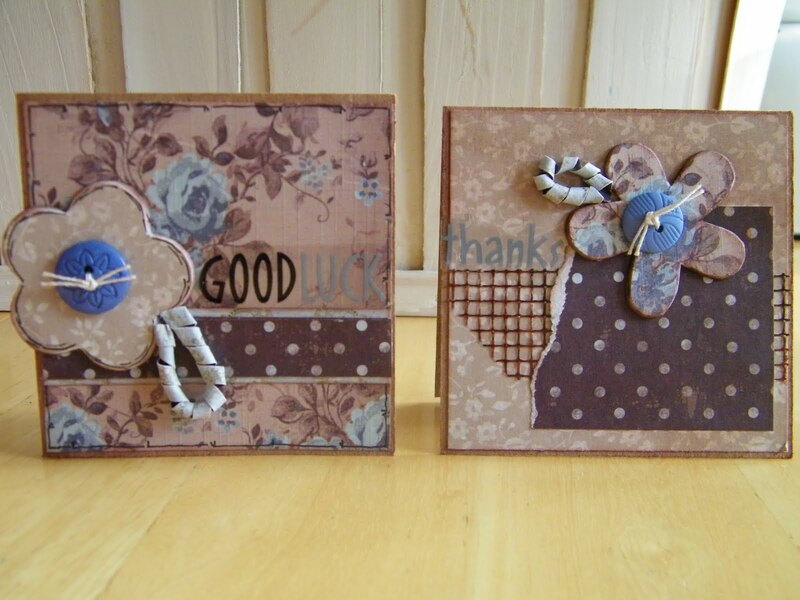 I made this card using one of the SRM Thanks Sentiment Stickers. 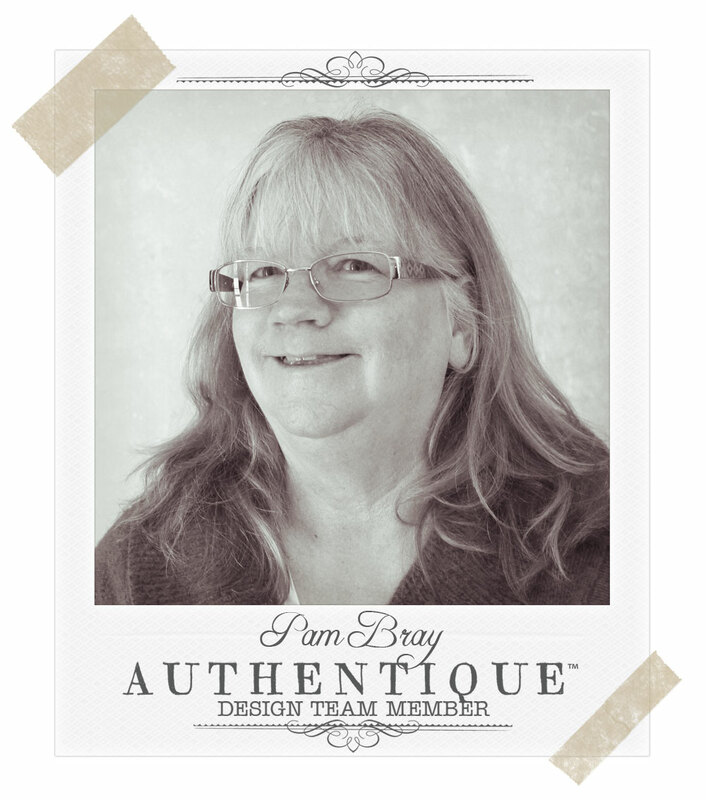 I was honored recently on being featured on their blog with a card that I had made for breast cancer awareness. If you have never tried their stickers. 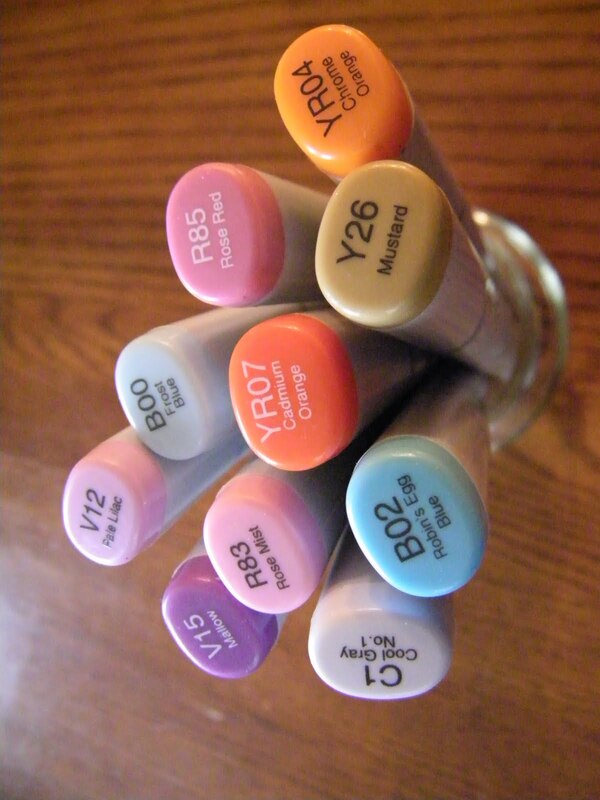 They are a must; so easy and convenient to use but my favorite is that they are gorgeous. My card papers are from The Girls' Paperie Toil and Trouble. 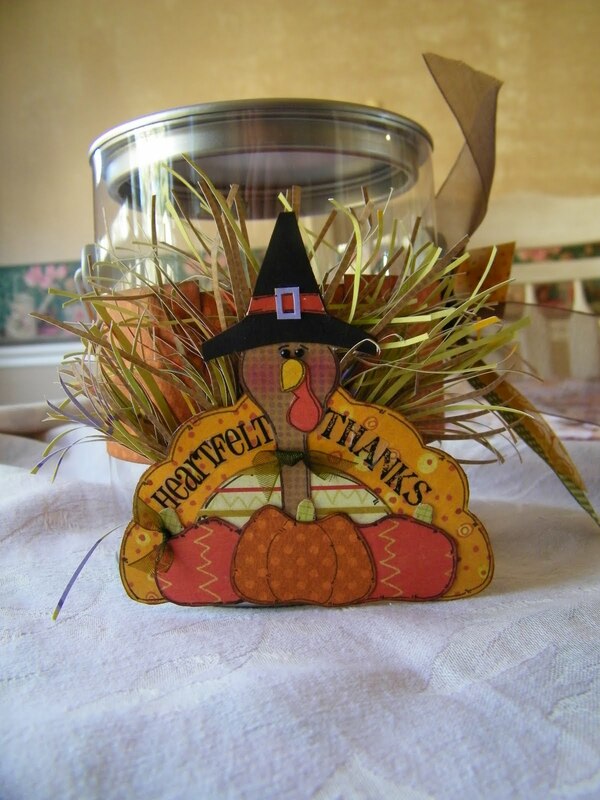 I know it is Halloween paper but who says it can't be used as a Thanksgiving Card, it is perfect. 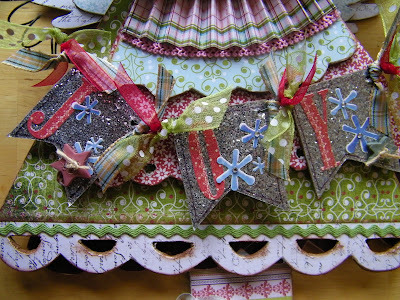 I did these little diamonds for the inside of the card and fussy cut the filigree from the Parlor paper for the top of my border that is on the outside of my card. I matted all of my pieces with Black card stock to help it pop off my Orange 5x7 base card. I used the Little Yellow Bicycle Christmas Delight to make my card. 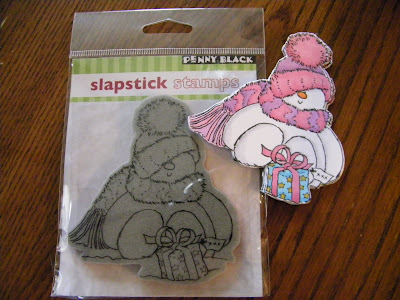 The Happy Holidays are stickers from the same collection. My card is 5" x 7" and I used the Tis The Season Stripe paper on top of my card. 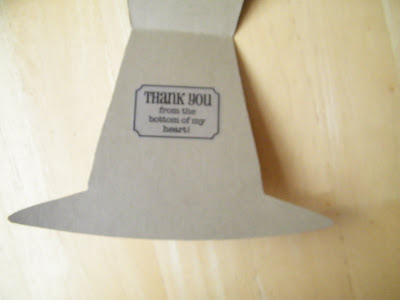 I cut a window out of the paper before I placed it on my card so that my package that I fussy cut from the Great Big Cut Outs would fit into the inside. I also paper pierced and used my Le Pen made it to look like stitch lines. 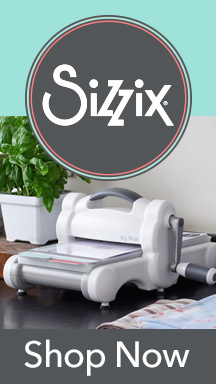 Here is a closer look in case you don't have a sewing machine. This is a quick way to make it look like you do. 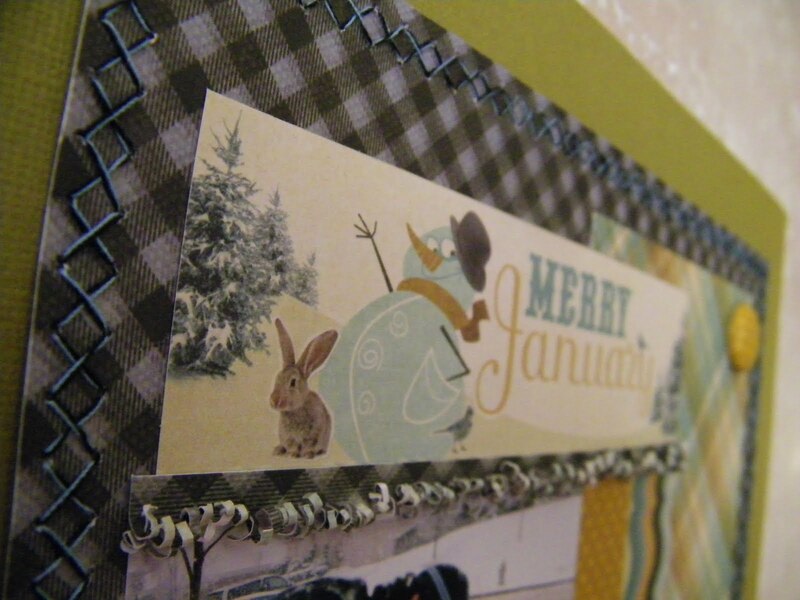 I did though sew around the outside edge of my card base. I added the ribbons and buttons after I got my package inside the window. Here is my card for the Bo Bunny Card Challenge Tuesday. We are suppose to use something from nature. So am using the picket fence that was once a tree and now is this cute little fence. Here is a little closer look at the fence so you are able to see it is wired together. 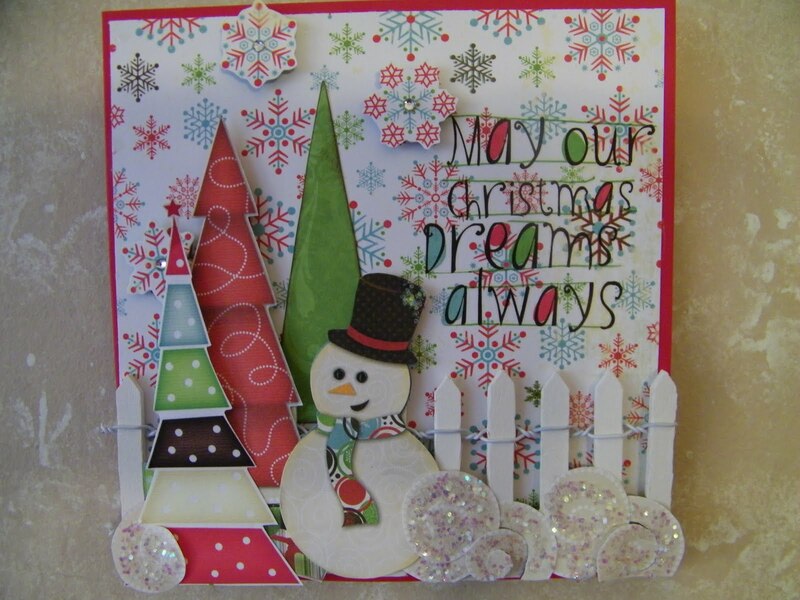 It is a fence that I purchased from Make It Christmas line. 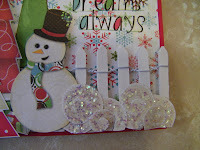 I used the Bo Bunny Tis the Season Treasure and Cut Outs for my card along with the Bo Bunny Holiday Dreams Rub Ons. I fussy cut all of the pieces out and placed them on pop dots. 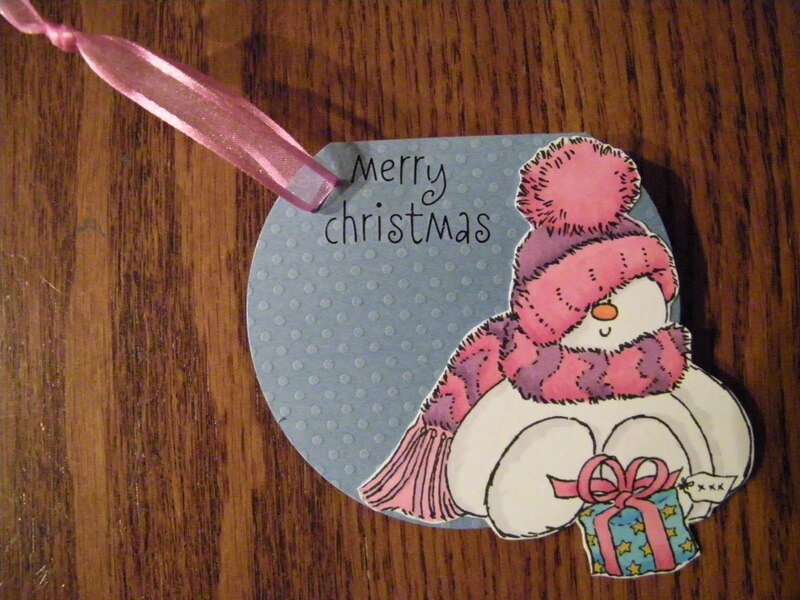 Added some of the Chunky Crystal Glitter to the snow and on top of the snowman's hat to give it some sparkle. 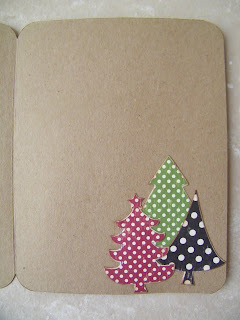 This is a side view of the card so you can see the pieces that are up on the pop dots. I couldn't forget the inside of the card. 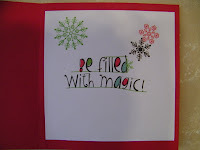 I used some of the Dreams Rub Ons on the outside of the card and added the rest of the phrase to a 5"x5" piece of white card stock to the inside. 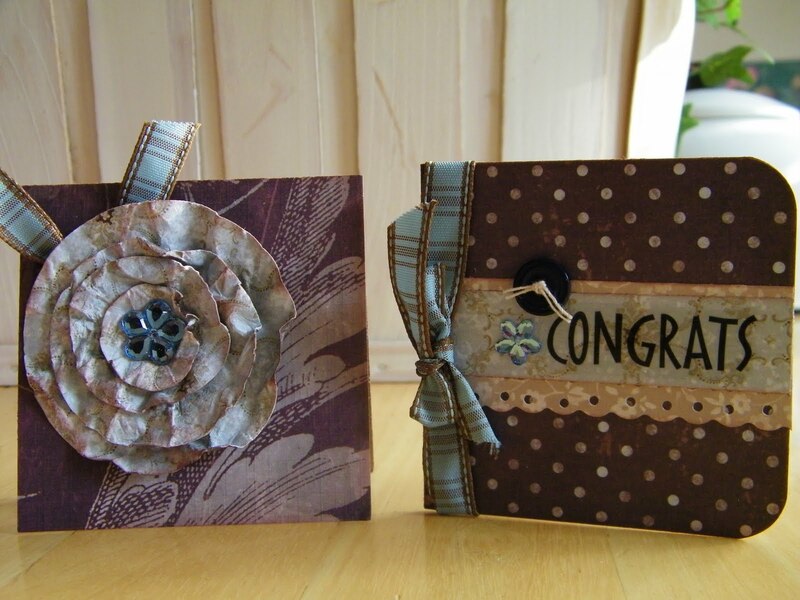 My total dimensions of my card is 5 1/2" x 5 1/2"
I j ust seen this challenge with CARDS, it is MINI CARDS. challenge. 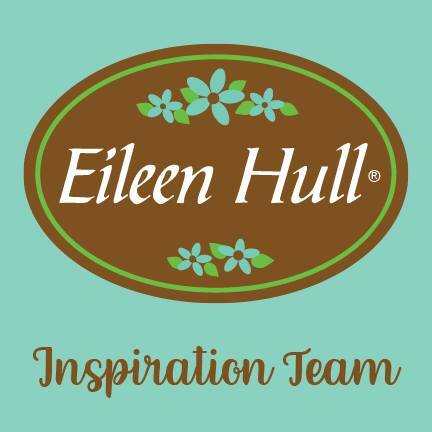 I don't think there is a prize just a time to be inspire. I just happen to have these made from a prior spotlight that I did with GCD Studios so I decided I would go ahead and submit them. 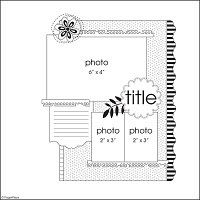 CARDS require that the mini card be no bigger than 3″ and the photo be mailed to paiget@northridgepublishing.com by next Thursday morning, November 18th. 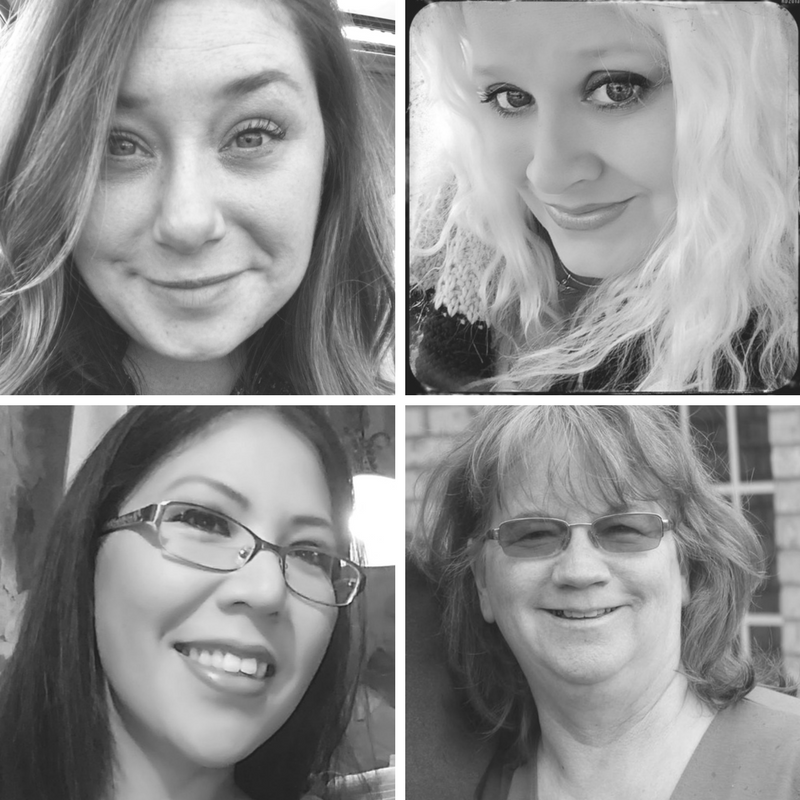 Hope all that see them get inspired, mini's are so fun to make. 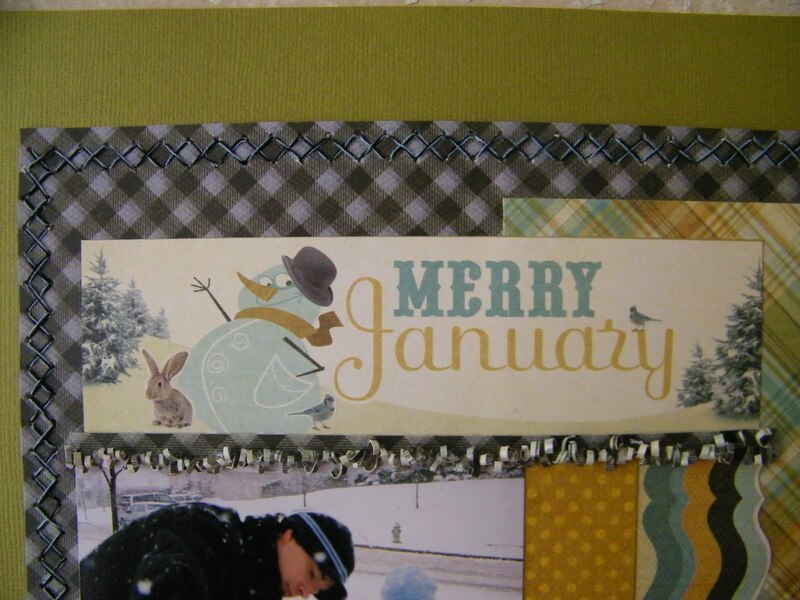 Take a look at this fabulous stamp from We R Memory Keepers, it to is from the "Merry January" collection. 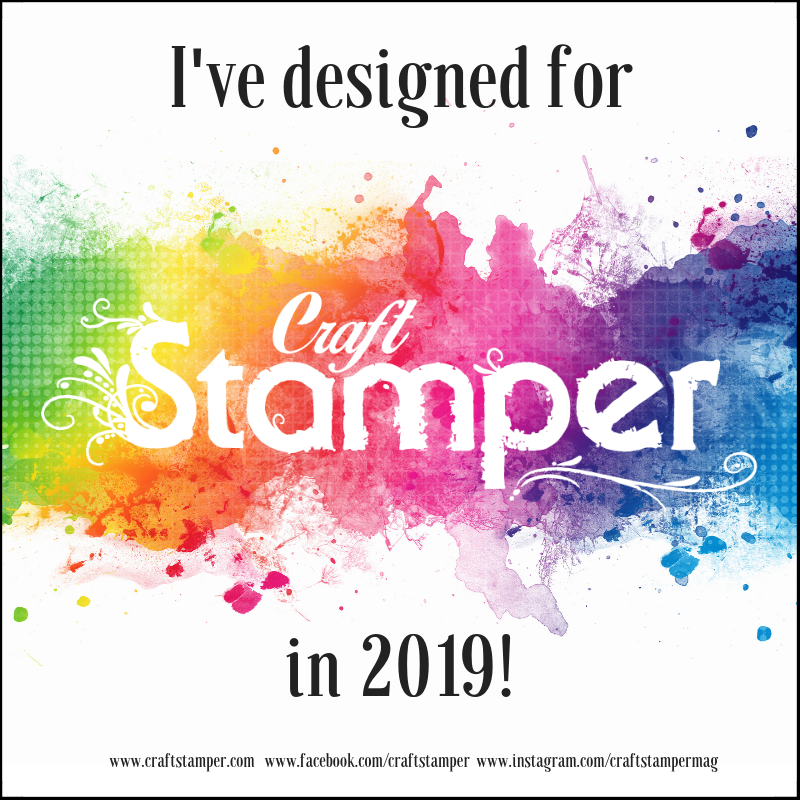 I stamped directly on my Bo Bunny Curry Dot paper and then I paper pieced it on top of the stamped image by just repeat stamping on scrap papers from the collection, cutting and gluing it to the top of the stamped image. 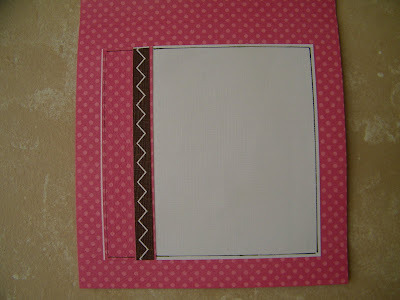 Look at my ruffle border that I placed on my page to go along with the Page Map sketch. 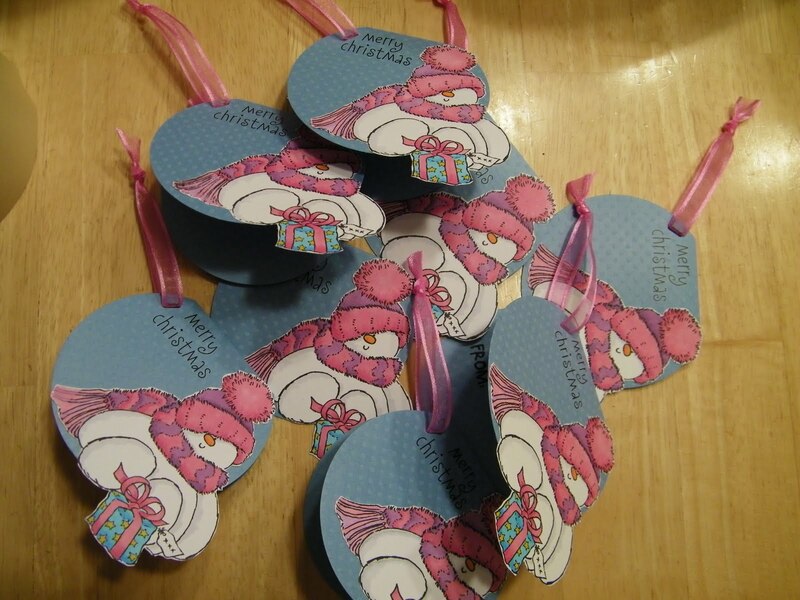 I cut 3/4" strips of paper and then with my scissors made narrow cuts into the strips going almost to the edge. I then took tweezers and rolled up every other one to make the rolls. It is so, so easy and gave a great look to the page. I then just adhered it to the photos in the lengths that I needed. 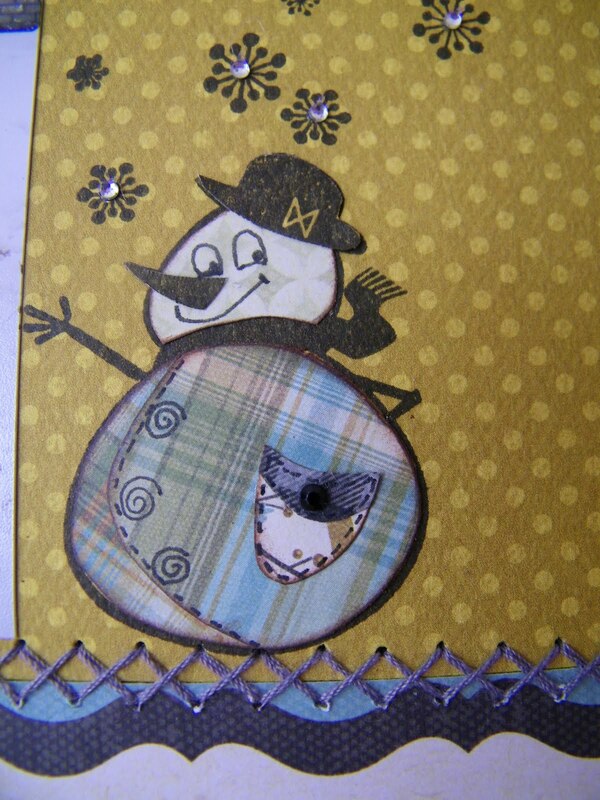 Another look at the rolled border along with a tag from one one of the pieces of paper.